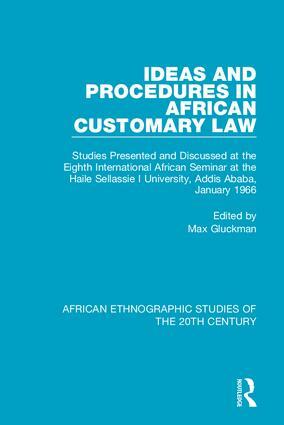 The 18 papers in this volume, originally published in 1969 in English and French, with summaries in the other language, define and analyze in their wider social contexts the fundamental ideas and procedures to be found in African traditional systems of law. They assess the needs and problems of adaptation to changing conditions. The comprehensive introduction by Allott, Epsteina nd Gluckman provides a framework of analysis. It deals with the search for a common terminology in which to analyse and compare the different systems of customary law proceedings and evidence, codification and recording, reason and the occult, the conception of legal personality, succcession and inheritance, land rights, marriage and affiliation, injuries, liability and responsibility. Herman Max Gluckman was a South African and British social anthropologist. He is best known as the founder of the Manchester School of anthropology.